Microsoft has invested in two new cables to connect its North American data centers with facilities in Ireland, and it says it will soon help build similar data networking links to Asia. "Over the past 9 months, Microsoft has been significantly investing in subsea and terrestrial dark fiber capacity by engaging in fiber partnerships that span multiple oceans and continents," Redmond network enablement bigwig David Crowley said in a blog post. On Monday, the software giant announced partnerships with Hibernia and Aqua Comms, each of which will provide a cable that links Microsoft's North American infrastructure with data centers in Ireland, and from there to the UK. "These cables will help deliver data at higher speeds, with higher capacity and lower latency for our customers across the globe," Crowley said. 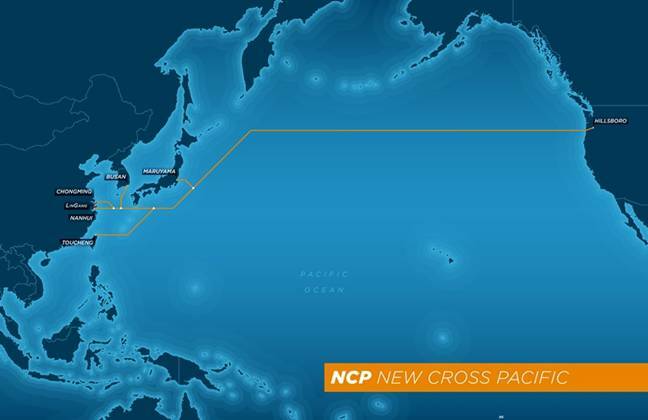 In addition, Crowley said Microsoft has joined a consortium of companies that are working to build the first-ever physical landing station connecting North America to Asia, in what will be known as the New Cross Pacific (NCP) Cable Network. Additionally, Microsoft said it had joined a consortium comprised of China Mobile, China Telecom, China Unicom, Chunghwa Telecom, KT Corporation with TE SubCom as the cable supplier,. The NCP cables will span more than 13,000km (8,078 miles) and will link facilities in Hillsboro, Oregon with Chongming, Nanhui, and Lingang on the China mainland; Busan, South Korea; Maruyama, Japan; and Toucheng, Taiwan. Besides Microsoft, other NCP consortium members include Chinese firms China Mobile, China Telecom, and China Unicom; Taiwan's Chunghwa Telecom; South Korea's KT Corporation; and Japan's SoftBank Mobile. The undersea cables for the effort will be supplied by New Jersey–based TE SubCom. Naturally, for Microsoft the effort is all about plumping up its cloud services, including not just Azure but also SaaS offerings such as Office 365 and Dynamics CRM Online. Crowley said Redmond is focusing in "holistic innovation" that will provide value to its customers from the "sea to the sky." "When we look to the future with these investments, we believe our customers will see that Microsoft is pulling together all the components necessary to make its cloud services the most reliable, accessible and secure," Crowley said. Microsoft isn't the only US tech firm investing in undersea network cables, though. Last August, Google said it would invest $300m in a set of six fiber pairs linking the US West Coast with Chikura and Shima in Japan.